INCLINED PLATFORM LIFTS (IPL) are designed for use on stairs or ramps that allow a rider in a wheelchair to travel up to six landings. IPL’s are compact units that can be stored off the staircase or at the landings without encroaching on the stairs. 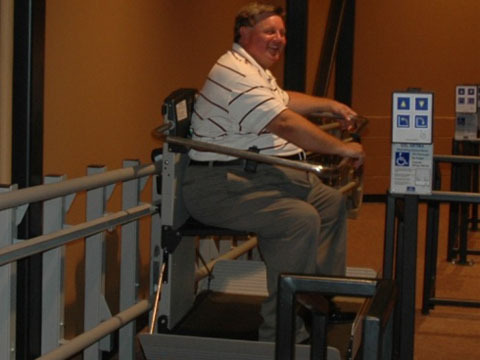 Incline platform lifts are truly the most versatile accessibility product on the market. They meet almost every application from straight runs to spiral staircases. 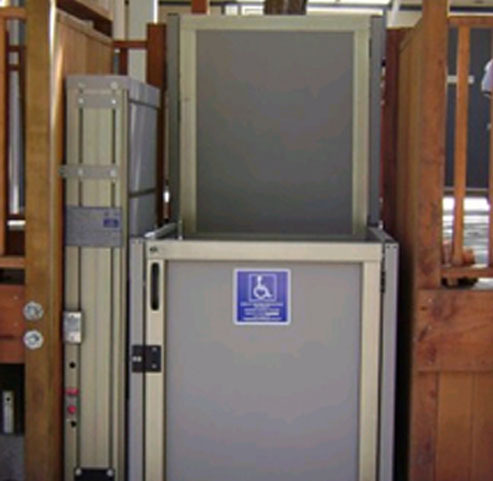 VERTICAL PLATFORM LIFTS are a great solution for lifting heights up to 12 feet. Porches, stages, platforms and even floor to floor applications are perfect for VPL’s. To meet ADA Accessibility Guidelines, a ramp for a 5’ rise is nearly 70’ long and takes up approximately 210 square feet. A VPL is much easier for a person in a wheelchair to use and only takes up 5 square feet. VPL’s are used in both commercial and residential applications. STAIRCHAIRS are the simplest solution for those who are ambulatory but are challenged by stairs. Units come in a wide range of finishes and configurations. They are available in the traditional seat model and also in standing platforms. Units are available for straight runs as well as curved units for stairs with landings. LIMITED USE LIMITED APPLICATION (LULA) elevators are now allowed in the State of Tennessee. Primarily used in churches and private clubs, a LULA is just a small elevator. The sizes and hoisting methods are similar to a residential elevator but they have automatic, side sliding car and hoistway doors just like their larger cousins. In two story buildings where space is at a premium, a LULA may be the best option.